How does one honor a Nobel Prize winner at the University of Missouri? By tailoring the ceremony to best reflect the honoree’s personality, of course. After Dr. George Smith, MU Curators Distinguished Professor Emeritus of Biological Sciences, was awarded the 2018 Nobel Prize in Chemistry earlier this October, the MU Operations Staff immediately knew how they were to honor Dr. Smith for such a high achievement. Karlan Seville, communications manager for the vice chancellor of operations, was aware universities where previous Nobel Prize winners worked to learn they were awarded with life-long parking spots on their designated campus. The only problem is that Dr. Smith’s main form of transportation is not a motor vehicle. It’s a bicycle. That’s when Seville decided that a dedicated spot to park his bike would be much more appropriate. On Oct. 18, 2018, a small crowd huddled behind the southside of Tucker Hall, the hall where Dr. Smith has worked for over 40 years. 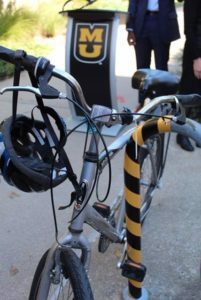 Tucker Hall became his home away from home so it was naturally fitting that the dedicated bike parking be located within such vicinity. To begin the unveiling of Smith’s designated rack, Dean of Arts and Science Pat Okker and Academic Senator with MSA Solomon Davis spoke about Smith’s achievements and sustainability efforts of bicycling to work each day. Faculty and staff lifted up a black cloth that was covering a sign that reads, “Reserved. 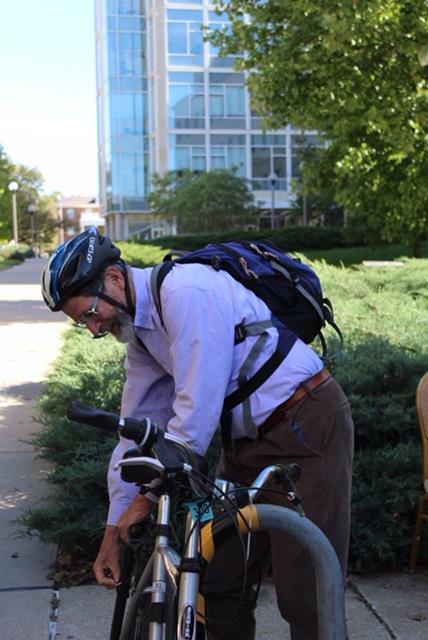 Dr. George Smith, PhD 2018 Nobel Laureate in Chemistry”, before Smith approached his place at the bike rack to lock up his alternative transportation. Dr. Smith stepped up to the podium and first thanked everyone for coming out and supporting him. He then went on to explain that biking was his only mode of transportation upon moving to Columbia, Missouri, in the 1970s. After giving a shoutout to Pednet and their efforts with safe biking in Columbia, Smith added that the town is a great location for biking, acting as a safe mode of transportation for individuals of all ages. “It’s safe for many young people and it’s safe for people whose driving skills are declining, like me,” Smith joked. Smith concluded the ceremony on a funny and humble note, adding one last remark about his honorary location on the rack. Dr. Smith was awarded the Nobel Prize in Chemistry on Oct. 3 for the development of phage display. His research allows for the creation of new proteins, which in turn helps create vaccines and treatments for diseases with the use of antibodies. Smith is the first MU professor to receive a Nobel Prize.